In 2018, a monumental wallpaper is installed on one of Rubis Terminal Rouen’s tank, created after a photography from the Peak Oil series by artist Geert Goiris. The sulcata turtle which is represented is a symbol of longevity and stability and can be considered as an actual living fossil whose origins date back to prehistory. It thus echoes, according to the artist, the hydrocarbons on which our society depends. 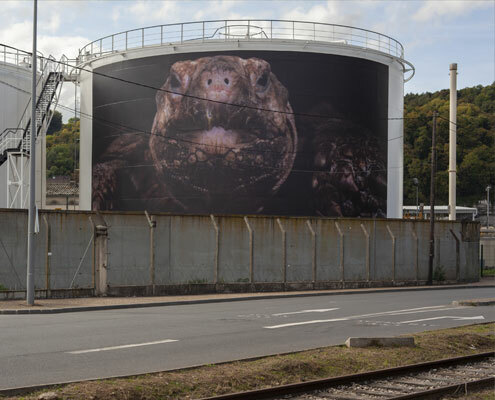 By transferring this sulcata turtle to Rubis Terminal Rouen gigantic tanks, Geert Goiris creates an analogy between the animal and the oil activity of this industrial area. Peak Oil is the title of a large scale photographic commission to the Belgian artist Geert Goiris by the Frac Normandie Rouen and Rubis Mécénat. Throughout the year of 2017, Geert Goiris visited 12 industrial sites of Rubis Terminal (subsidiary of the Rubis Group), covering all depots in Europe. The aim of the project has been to develop a photographic series on the contemporary industrial landscape. The project has already given rise in December 2018 to an exhibition at the Frac, an installation in the Port of Rouen and a book.